Toren stared at his knees. There wasn’t much else he could see from here, besides dirt and brush. The men were joking with each other about what they were going to do with the ransom money. He chewed a little on the ball of cloth in his mouth and wiggled his hands behind him. They were going numb again. “Heh. Sounds like fun, Bart. First stop, then: a couple o’ whores and some fancy booze. Good for the soul, that is.” Toren heard one of the men step closer. “I got an idea! Let’s whack off one of the kid’s ears and stuff it in the note! Hey, I told you to shut up, kid.” Toren felt the boot slam against his rear. He tried to stop whimpering. A rough hand pulled him up. “C’mere, brat. Lemme at thaunhh….” The man dropped him and fell across his legs. Toren tried to scream when he saw the arrow sticking out of the man’s back. He looked around, shaking. The other man had someone on top of him. The newcomer pulled a short sword out of the rogue’s side. As Toren watched, the sword was wiped on the tunic of its crumpling victim. Its owner stared at Toren. The man sheathed his sword and stood. He was a woodsman, a young man with a blond braid down his back. Still watching Toren, he inserted two fingers into his mouth. He whistled: pata-pata-twee twee twee twee tweet. A moment later, a return call came from deeper in the forest: pata-pata-twee tweet. The blond vanished into the brush. Toren waited, willing himself not to panic. There were more whistles, short and long, near and nearer. He heard a horse whicker behind him. It sounded like the one he’d been thrown over for two days. In a few minutes, the woodsman returned. A taller, darker man followed him. They both wore a mix of skins and woven cloth. They placed their feet carefully, hardly making a sound as they walked. The brunet now stared at Toren. He came closer to study the boy’s face, then retreated to confer with his friend. Their voices were too low for Toren to overhear. The conversation ended. The two men grabbed the body that lay over Toren’s legs, lifting it off. The brunet produced a knife. He cut the ropes around Toren’s legs and arms while the blond rifled through the clothing on the bodies. “I don’t think so. I didn’t see any,” Toren whispered back. Behind them, the blond was frowning at something he’d found. “Hey, Kyle.” He flashed a gaudy cloak pin at them before pocketing it. “We’ll give it back to him. Rolf is your regent, right?” said the brunet, Kyle. Kyle waved a hand. “You look like your older brother. Come on, let’s see if you’re good to go.” He took Toren’s arm and raised him to his feet. Toren collapsed with a howl. He clutched his ankle and rocked on the ground. He’d forgotten that he was tossed off the horse yesterday, twisting his foot around. Kyle kept his hand on Toren’s shoulder until the boy calmed, then rejoined his companion. The woodsmen spoke quietly. Kyle smiled at him briefly. “Hold on.” He turned back to the blond. “Stopper it, will you? 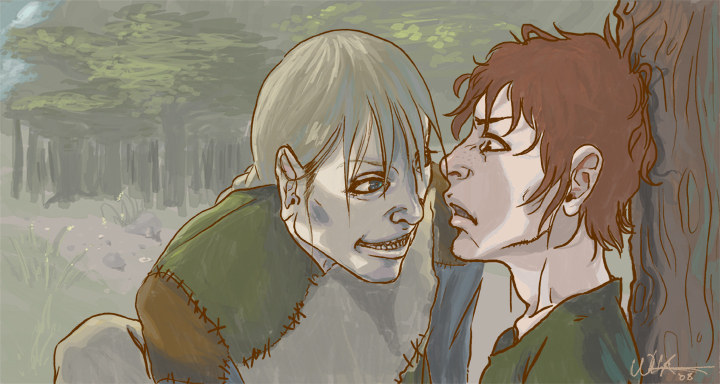 We’ll get to you.” The blond glared at Toren. The men continued to speak while Toren sulked. He was working up a mood. He was good at that. Moods were his secret to getting what he wanted. “Look, I’m the lord of Lillenfeld!” he declared. He was only stretching the truth by a few days. “Just do as I say, and I promise you’ll be rewarded. If you don’t do as I say, you’ll live to regreeeaaaaaahhhhh“, he said as the blond leapt toward him like a wolf. The woodsman landed on all fours, straddling the boy’s legs, his face inches from Toren’s. The boy pressed himself to the tree. The blond’s manic grin was as frightening as his wild green eyes. After a few long moments, Toren noted that the man wasn’t doing anything. He was crouched over Toren and grinning like a lunatic, but he wasn’t actually harming Toren. He wasn’t moving at all. Toren tilted his head slightly to look at Kyle. Kyle was observing them, his hand over his mouth. The blond leaned forward suddenly. He licked Toren’s cheek from chin to eyelid. Toren shouted and flailed, but the blond had moved away. Toren blinked up at the blond. He looked to Kyle for help, but the brunet’s back was turned. The dark ponytail was shaking. He eyed the blond again. The man stood there with an earnest smile and clear gaze, bending down to offer a hand. Toren breathed deeply. It was probably best to accept the woodsmen’s help, since they knew their way around here. He just had to stick close to Kyle. Toren yelped. Kyle had removed the boy’s shoe and was gently prodding the ankle. “Sorry, milord. There is some good news here. Your ankle doesn’t look broken, just bruised. It should be fine in a few days.” The man turned to rummage through a leather bag. “A few days? But I’ve already been gone for two. It’ll be two more to get back. That makes at least six days I’ll have been gone. I’ll miss my own coming-of-age party. I’ve been planning it for months!” Toren scowled. “I don’t think I’d worry about that much, milord.” Kyle found a strip of cloth and began binding the ankle. Toren scowled some more. He looked around the cave that the woodsmen used as their shelter. Ash had gone back to retrieve the pair of horses. Toren was glad to be alone with Kyle. The brunet seemed sane. Kyle looked up at Toren. “Tell me how the kidnappers got to you, milord. Were you away from the manor?” His voice was deep and resonant, with a Sunup accent. Toren thought. “No, I didn’t see anyone. We must have gone through the gate, because they didn’t carry me over the hedge. I don’t know where our men were.” He remembered the cloak pin that Ash had found. “Do you think they… killed everyone?” he whispered. “I doubt it,” Kyle said. “It was probably a mistake in the change of shifts, or something like it. Criminals can be very patient while learning the routines of a household.” He lifted Toren’s ankle carefully and passed the cloth underneath it. “He was kidnapped by two men, ten years ago now. I was eight. My father went after him with some of his men, but he was killed by the bandits. So was Brant. Rolf was there. He saw it.” Toren felt a flicker of sadness, but it had been a long time. “Yes. He said they both fought bravely but the bandits killed them. Oh, and he said the bandits were from Sunup and Crosscreek, one with brown hair and one blond. I guess these two were different….” Toren stopped. He eyed Kyle thoughtfully. And so the evening passed, pleasantly enough for one seated on hard stone many miles from home, nursing an injured ankle in the company of strangers — one decidedly stranger than the other. Toren was grumpy. A whole day had gone by and his ankle still hurt. The men had made him a cushion of soft grass, but his rear was getting sore from sitting. He thought his whole body would hurt soon. At least the rabbit stew smelled good. Kyle stirred an iron pot that hung over the firepit. Ash sat beside him, feet dangling over the ledge of the short cliff. It was about fifteen feet from the cave down to the clearing. Toren could hear the horses pacing below them. Ash held a stick in front of him like a fishing pole. From it dangled an assortment of bones and leather strips. The pieces were woven together loosely. When suspended, the thing made a rough triangle about two feet on a side. 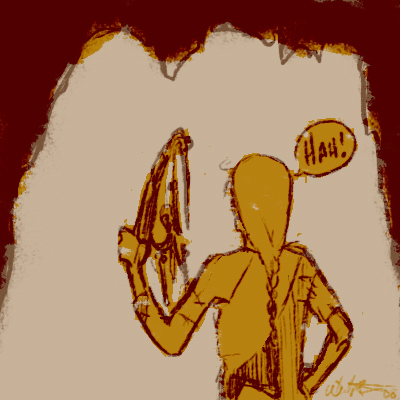 When leaning against a cave wall in the dark, it looked like an eviscerated animal. It had scared the hell out of Toren the night before. Now the boy watched closely. Magic always interested him. “What does it say?” He dragged himself nearer, minding his foot. Toren was working up another mood when he saw the bones tremble. The entire triangle had developed a wobble. A ripple formed, moving from one side of the web to the other and back, banging the bones and straps against each other. It gradually calmed, leaving the overall shape changed. A few bones fell out of the weave. Toren heard them tumble down the cliff. “Eww!” It was one thing for Ash to be weird, as usual. The way Kyle kept smiling made it worse. At least it didn’t look like Ash was serious this time. Kyle’s deep voice led them through a simple song about harvest time. The whistle piped along with them. They sang a few more autumn songs after the meal. During the third song, Toren relaxed against Ash’s shoulder. Kyle was rubbing Toren’s left leg, lightly over the foot from the toes to the ankle, then more firmly up the calf. It felt good. Toren’s eyelids began to droop. Kyle was a handsome man, Toren decided. The long, dark hair was loose while Kyle ran his fingers through it. Ash helped him pull out the knots, his own sun-coloured hair already rebraided, and leaned forward to kiss Kyle’s cheek now and then. Toren had seen the two embrace a few times. He hadn’t felt jealous until now. Kyle smiled at him. “We like it here,” he said. Toren waited. “That’s all? It’s nice in town, too. There are other people around. You must get lonely here with no one else to talk to,” besides that blond freak. “We have friends. Once the creek beside us freezes, we’ll go stay with the Crow. Their river doesn’t freeze over in winter.” Kyle finished untangling his section of hair and reached for the tie. Toren had never heard of anyone other than bandits living in the forest. He chose not to say so. He didn’t want to offend Kyle. Ash, on the other hand, didn’t mind offending anyone. He moved to Toren’s side and put his arm around the boy’s shoulders. “You know,” he whispered, “I bet old Crow would think you’re cute enough to eat. I know I do.” He stuck his tongue in Toren’s ear. By the time Toren started swinging, Ash was out of reach, cackling. “Ash!” Kyle grabbed the blond’s arm. The two men stared at each other, Kyle’s glare to Ash’s smirk. After a moment, Kyle nodded toward the clearing. They left the cave. Toren scooted toward the ledge. He leaned onto his side to spy on the woodsmen. They were walking away, toward the creek. They argued. Toren could make out a few words: “You can’t… flirting… kidnap… Brant would’ve wanted… don’t… we have to… but the regent…” and then they were too far away. They sat down beside the water, still bickering. Toren could barely make out their voices over the creek and the birdsong. He lay back on the stone. He intended to think over what he’d heard, but grew distracted. The pattern of light on the clouds said it was mid-afternoon. The sun never came out this far south. It stayed behind the mountains all day. Lillenfeld itself saw some sun for a few hours, from mid-morning onward depending on what part of town you were in. Crosscreek, in the southeastern corner of the valley, reportedly received a single hour of sun a day. Only Sunup, in the north, was blessed by direct light from early morning to late afternoon. That town was the largest and had the biggest harvest each year. Sunup traded their excess food for hard goods, mostly the iron mined and worked in Crosscreek and the wool from Lillenfeld. The clouds darkened and shot sideways. Toren must have fallen asleep. He yawned in case he needed to. He shifted onto his side to look for the woodsmen. Kyle was lying down beside the creek. Ash was kneeling over him, his head bobbing up and down in the vicinity of Kyle’s stomach. Toren squinted in the fading light. His eyes opened wide. He quickly rolled onto his back, then returned to peering over the ledge. He pressed his hand to his crotch while he watched Kyle’s hands stroke Ash’s braid, the blond head still moving up and down. Toren tensed his legs, then relaxed them. He did it again. He tried to hold his hand still. He failed. The hand went into his trousers and grabbed his member, sending a familiar thrill through him. He stroked in time with the bobbing, steady and deliberate. Kyle was removing the leather tie from Ash’s braid and was running his fingers through the hair, freeing it into flowing locks that spilled down around Kyle’s middle. Ash didn’t change his rhythm. Toren whimpered a little. His other hand joined the first. He wished the men were closer so he could see better. He focused on matching Ash’s pace, down and up and down, as he start to breathe hard. Toren imagined what it would feel like to have that mouth on his member, kissing and licking. The thought made him close his eyes. He imagined Ash in front of him, blond hair flowing over Toren’s hips as lips and tongue caressed him, licking and sucking him. He imagined stroking that soft hair. He thought of what it would look like, seeing his member disappear into that pink mouth, over and over. He added Kyle, holding Toren from behind. Kyle’s strong arms would be around his waist as warm lips kissed Toren’s cheek, his neck, his shoulder. He imagined Kyle’s hand stroking his buttocks. He groaned at the shiver this produced. He pushed the thought further, Kyle’s hand going between to cup the ballocks, squeezing and stroking. All the while, Ash licked him up and down, up and down, up and down. As though the two were my consorts, he thought. My consorts. Toren liked the way that sounded. A lord should have a consort, or even two if he could afford them. Toren thought the lord of Lillenfeld should have two consorts. He was brought back to reality by Kyle’s moan. The sound drove Toren harder. He pulled up and down on his member, edging closer and closer to climax. He thought of Ash’s lips, of Ash’s tongue, of Kyle’s mouth and his moan and my consorts and Toren came, unable to stop himself from shouting as he curled on his side at the edge of the cave, beside the firepit, under a darkening sky. He rested, panting. It had been days since he’d been able to release himself. Four days, he decided. Five, if you didn’t count the morning of the day he’d been kidnapped. Hearing a voice, he slid back into the cave. He wiped his hands off against the rock as he went. He tried to wipe away the resulting dark spot, then gave up. The evening light would soon be dim enough to hide it. He sat against the wall with only a mild complaint from his ankle. The three of them would be leaving for Lillenfeld tomorrow, Kyle had said. They would return Toren to the manor. He would tell Rolf to give Kyle and Ash each a reward. Something clicked inside him. An idea formed itself. It was a wicked idea that made him feel a pulse in his member. Rolf wouldn’t like it, but Toren couldn’t stop the plan that was forming. He would be lord when he returned. A proper lord should have two consorts, shouldn’t he? And what better reward could he offer his new friends than a life of ease and luxury, soft beds and warm baths? Toren felt giddy. What a wonderful surprise he had in store for the woodsmen! Of course they would accept his offer. Wouldn’t they? This entry was posted in Bang*Bang no. 14, Text and tagged haitoku, Shoe. Bookmark the permalink.